Television Removal & Disposal | 1800-GOT-JUNK? 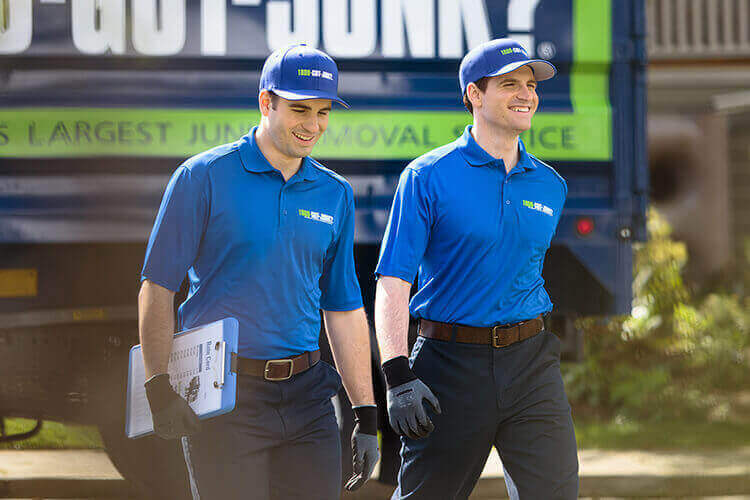 TV Removal & Disposal by 1800-GOT-JUNK? Want to handle your television disposed of responsibly? 1800-GOT-JUNK? can come to your home, haul away your old TV, and ensure that it is properly disposed of or recycled if possible. 1. Schedule your TV removal appointment online or by calling 1800-468-5865. 3. When we arrive, just point to the TV you want removed and we’ll provide you with an up-front, all-inclusive price. If you want to handle your old television disposal responsibly, but just don’t have the time to handle it on your own, give 1800-GOT-JUNK? a call. We’ll come to your home, haul out your old TV, and ensure that it is properly disposed of, or recycled whenever possible. You’ll save time and money, and you’ll feel good knowing that your television has been properly disposed of. Can I throw a TV out with the rubbish? If you have an old television you need to get rid of, it might be tempting to just put it out on the curb with your regular household rubbish. However, many rubbish pickup services don’t pick up televisions, so it might not even be an option. If you don’t want to take care of disposing your TV on your own, you can have 1800-GOT-JUNK? handle it for you. We will pick up your old TV and take it to the appropriate place to be recycled or disposed of. How should I dispose of an old or broken TV? If you want to save yourself some time and effort, let 1800-GOT-JUNK? help you dispose of your old TV. We do the heavy lifting for you—all you have to do is point. We do our best to ensure that your old or broken televisions are recycled or donated. If you want to ensure recycle your TV properly, you’ll need to take it directly to a recycling facility that is equipped to handle it. Of course, if you want to save yourself the trip, you can always call 1800-GOT-JUNK?. We’ll pick up your old television from whatever room its in and load it in our truck. You can rest easy knowing that we always do our best to ensure your TV gets properly recycled. If you want to get your old TV off your hands but don’t have the time or resources to get it to the proper recycling facility on your own, book your TV pickup with 1800-GOT-JUNK?. We’ll do all the heavy lifting for you, and will ensure your television is recycled and properly disposed of.